The latest in a line of new members of the WordJack Team is Keven Ages, our new Executive Director of Technology located in Toronto. Here are some questions I asked Keven so our employees and clients can get to know him better. What are your impressions of WordJack so far? WordJack has an awesome team and a set of unique challenges. I generally thrive under those conditions, so my impression of WordJack excites me for now and the future. I started out on the HelpDesk of a Dilbert type company and quickly got involved in anything web related (at that time, the “www” was pretty new). From there, I moved into the entertainment and agency worlds, learning how to cope with unrealistic timelines, heavy workload, and tight collaboration. This set me up to work with an exciting startup that advanced the Digital-Out-Of-Home (DOOH) industry with technical innovations, experimentations and cross-functional company knowledge-sharing. The company quickly became the industry leader, and as such was purchased by Canada’s 3rd largest outdoor advertising company. 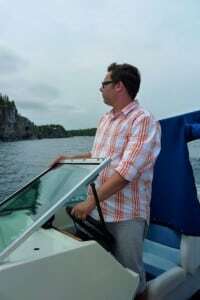 After regrouping for the summer in beautifully stunning Tobermory, Ontario, I accepted a position at a large company that was run in the spirit of the Startup Movement. There, I participated in and led various Startup Weekends (creating a product and pitch in 48hrs) and acted in various mentorship capacities. Eventually, the company was sold to another company, and I found myself back at the Dilbert type company. Outside of my weekday work, I successfully started a creative web agency called Duhado, which boasts clients such as Nestle, Motorola and Logitech and often works on ground-breaking tech-marketing innovations. Although I have no involvement with Duhado anymore, I’m still family there. What goals/objectives do you hope to accomplish for WordJack in the near future? My main object, always, is to create software and tools for the entire team that are beautiful, a joy to use, and enrich everyone’s daily lives. What is one (or a few) of your favourite recent technology developments? This is like asking who my favourite child is (if I had children). I’m currently pretty impressed with Hoodie, Vagrant, and Puppet Labs, but only because I’m using them more and more. Next week, my answer may be quite different. Outside of work? You mean like driving back home from the office in Collingwood? Kidding! I have recently been bit with the travel bug. I also love watching documentaries, going to shows/concerts, and getting into as much trouble as possible with my wife of 20 years, Dawn. Welcome to the team, Keven!